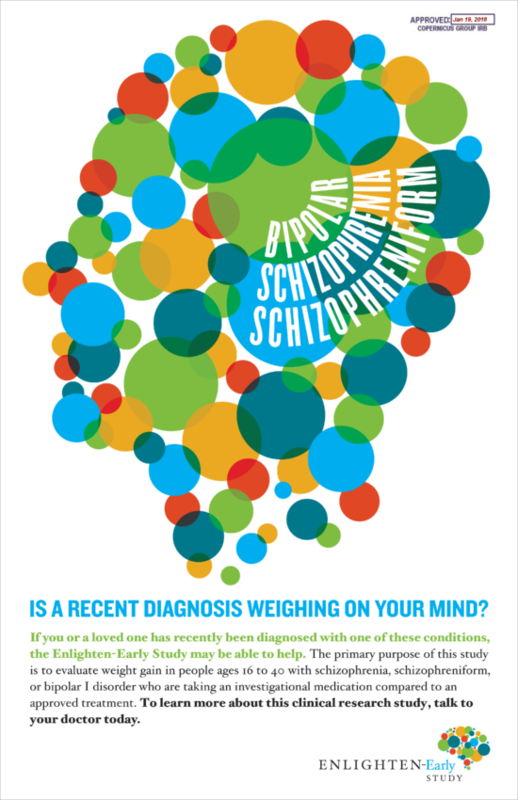 If you or a loved one has recently been diagnosed with one of these conditions: Schizophrenia, Bipolar I Disorder, or Schizophreniform Disorder, please call to learn more about the Enlighten-Early Study. The primary purpose of this study is to evaluate weight gain in people ages 16 to 40, with any of the disorders listed above, who are taking an investigational medication compared to an approved treatment. To learn more about this clinical research study and to learn if you or your loved one may potentially eligible, please contact Pillar Clinical Research at the Richardson, TX location by calling: 214-396-4844 or go to our contact page to fill out your info by clicking here.